Thousands of workers have staged a demonstration in the Bangladeshi capital, Dhaka to protest poor working conditions and safety standards for the country’s garment workers after a factory collapsed, leaving over 200 workers dead. On Thursday, protesters took to the streets and chanted slogans such as “we want execution of the garment factory owners”. On Wednesday, some 250 people were killed and over 1000 others injured after the eight-story building collapsed in Dhaka. The number of deaths at the Rana Plaza is expected to rise. 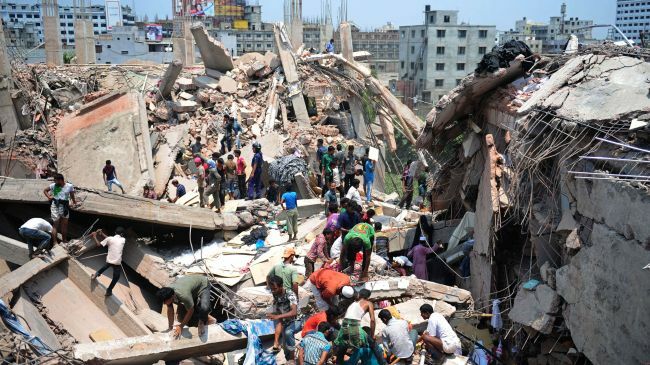 Reports say that more than 3000 workers were inside the garment factory at the time of the collapse. The factory located in the Savar district on the outskirts of Dhaka, housed garment factories and a shopping center. Police officials say factory owners had ignored warnings against allowing workers into the building after a crack was detected the day before. Last November, 112 workers were killed in a blaze at a factory in an industrial suburb of Dhaka. In 2005, more than 70 people were killed after a garment factory building collapsed in the same area. Bangladesh owns around 4,500 garment factories and is the second largest clothes exporter after China. The world as 100 people..